What are the basic differences in the styles of tables on the market today? With a large range of models and options available in traction tables the features that make each model unique and different tend to vary greatly. 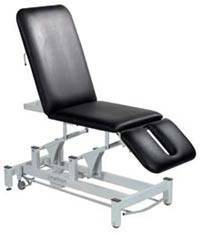 Most of the tables offer similar strength and stability, but some provide the option of customizing the table at the time of purchase for a cervical traction seating adjustment. In addition, some models offer universal rails for connecting traction units to the tables with ease. Other features include a bar type control that is used to lower and raise the table for easy access to the table. This bar takes the place of a foot or hand control, and because it wraps around the entire table, can be accessed easily from any point without cords on the floor or around the table area. Flexion stools and traction brackets may also come standard with some models while not with others. The number of sections to traction tables that can be independently positioned is also a variable. Some tables offer a two section option while others may include as many as seven. The more sections that can be independently positioned the greater the range of positions possible for the patient. Can traction tables be raised and lowered as needed and how stable are they at the top range of extension? A high quality traction table will be equally stable in all positions from the base low position to the level of full extension. For different tables the possible range in heights can be more or less, however a low of 18 inches with a high point of up to 38 inches from the floor to the top of the table cushion offers most therapist a comfort zone based on their own height. The head section, if it raises, can increase the height off the floor of the head, shoulders and upper body. Likewise, a multi-section table that allows for elevation of the feet and lower or upper legs can do the same. What options are available in traction tables and is there one feature that is most essential? The key features for most traction therapists and doctors when it comes to selecting a traction table is versatility and strength. Versatility is important so that a patient can be positioned on the table as required with the least amount of effort on the part of either the therapists or the patient. Traction tables that only allow one position without additional pillows, wedges, or other devices are much more challenging to work with and don't provide the patient with the same levels of comfort and support as those with multiple option positioning. Another important consideration for the rehabilitation therapist is how rigid and strong the table is all positions. If the table is unstable, wobbly or feels unsecured to the patient he or she is not going to be comfortable and relaxed, creating muscle tension that will hinder the traction session.